A truly active, healthy music scene needs ambassadors. People who do all they can to help the scene grow and develop into something larger than where it currently stands. Ambassadors can come in many forms – but no one is more capable to advocating for musicians than a fellow musician. Nicole Tyree performs under the name Angry Ana and she is a scene advocate. That includes being the organizer and founder of BytchFest – an event that shines a light on a range of female performers. 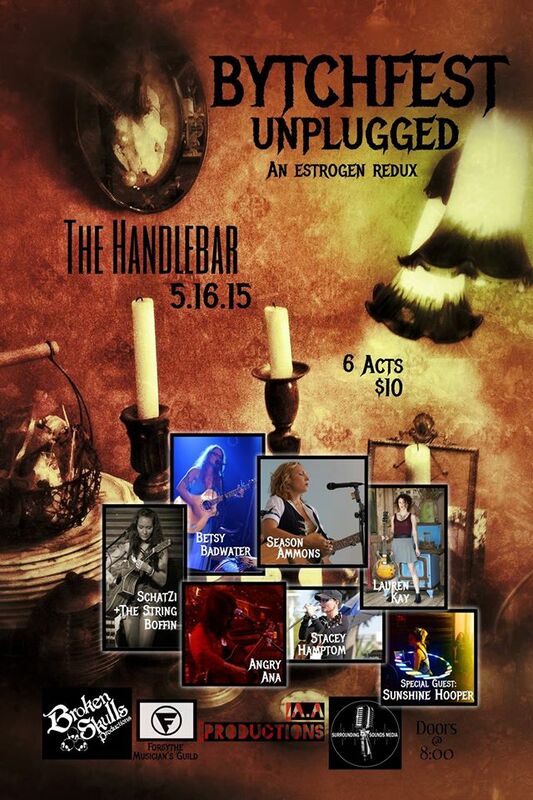 The event takes place at The Handlebar in Pensacola on Saturday, May 16th – with the doors opening at 8pm. For BytchFest that talent includes Betsy Badwater, Season Ammons, Lauren Kay, Schatzi+The String Boffin, Stacey Hampton, and Angry Ana. In addition Miss Sunshine Hooper (aka Katrina Gumpel) will join for dancing visual effects during the event. All the more reason for you to attend the first one – to say that you saw how it all started. This entry was posted on May 13, 2015 by 850music in Posts.